Sometimes the best ideas are the simplest ones. 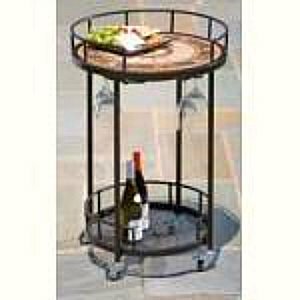 Outdoor serving carts fit that mold. There's really nothing fancy here - just a couple of shelves and a couple of wheels. But the added convenience is remarkable. 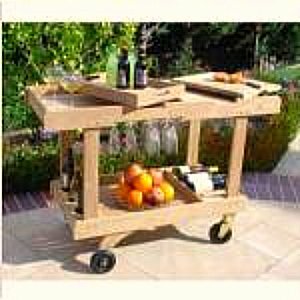 These carts will help you carry drinks, appetizers, main courses, desserts, whatever you need to get to your guests. They also provide a great place to store condiments, refill pitchers, a cooler full of ice, or anything else you need close by - without using up limited table space. Counter space is usually very limited outside, if not non-existent. 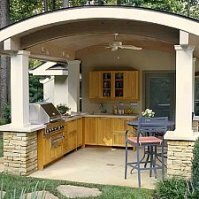 If you do have outdoor counter-top space, it may still be some distance away from where you'll actually be serving your guests. With one of these carts, one trip takes care of it, and you'll have a flat surface nearby for additional convenience. When its time to clean up, just load up the cart and roll it to the sink or the trash can. Whether serving, storing, or cleaning up, you can now make one trip instead of many. This is one of those times you'll be wondering how you got along without something this useful...and inexpensive! The least expensive carts are made of resin (plastic) and can be found for less than one hundred dollars. 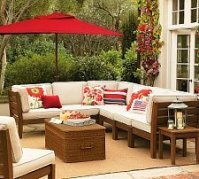 Models are available in a variety of styles, with one, two, or three shelves, two wheels or four. They are made from an array of materials as well. In addition to plastic, these useful carts are made of various species of wood, including the always popular teak, cedar and others. Try to match your mobile serving tray to the rest of your decor if possible. The more expensive models are made of wrought iron. 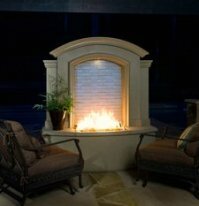 As with other wrought iron components, these can be as ornate or as plain as you like. These "high end" models range from $300 to $500 or so. 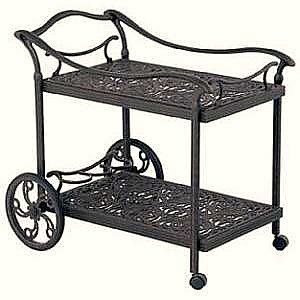 Wrought iron models are available in a small round version, frequently referred to as a tea cart. These aren't as useful for rolling around the patio as their larger cousins. 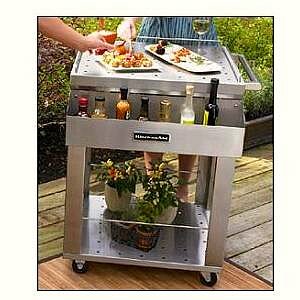 There are higher end outdoor serving carts that are also referred to as party carts. These models combine serving capability with storage and even refrigeration options. These are discussed on a separate page.